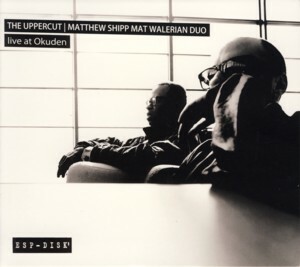 This wonderful album presents a live recording by a duo comprising of American pianist / composer Matthew ShippFind albums by this artist, one of the most important contemporary American Avant-Garde activists, with multi-instrumentalist / composer Mat WalerianFind albums by this artist, a Polish musician resident in the US, who plays saxophone, clarinet and flute. The album was released on the legendary NY label ESPFind albums on this label, one of the most important independent record labels in the history of Avant-Garde Jazz and Rock, founded in 1963 by a Jewish lawyer Bernard StollmanFind albums by this artist (who sadly died just three weeks ago) and its catalogue included some of the most important music recorded in America (and also sporadically in Europe) in the 1960s. The label stopped its activity in 1975 and was dormant for thirty years, resuming activity in 2005 and since releasing many new recordings, such as this one. The musical qualities of Shipp are of course no secret to the follower of his outstanding career, but Walerian emerges triumphantly as a virtuoso performer, with original ideas and a complete command of his instruments. His playing on this album immediately earns him respect and admiration from connoisseurs of the genre and of course anticipation for his new projects. Overall this is one of the best Avant-Garde albums I listened to lately, which deserves all the praise it can get and hopefully will reach as many open minded listeners as possible. An absolute delight!